← Hurricane Season – Are Your Trees Ready? A storm can leave trees looking like there?s no tomorrow. Major limbs may be broken or damaged, foliage can be shredded or stripped, or the bark may be torn or gouged. But what at first glance may look like mortal wounds are not necessarily fatal to a tree. Trees have an amazing ability to recover from storm damage. – Other than the storm damage, is the tree basically healthy and vigorous? If the tree is basically healthy, is not creating a hazard, and did not suffer major structural damage, it will generally recover if first aid measures are applied immediately after the storm. – Are major limbs broken? The larger a broken limb is, the harder it will be for the tree to recover from the damage. If a majority of the main branches are gone, the tree may have little chance of surviving. – Has the leader (the main upward-trending branch on most trees) been lost? In species where a leader is important to upward growth or desirable appearance, it may have to be a judgment call. The tree may live without its leader, but at best would be a stunted or deformed version of the original. – Is at least 50 percent of the tree?s crown (branches and leaves) still intact? This is a good rule of thumb on tree survivability. A tree with less than half of its branches remaining may not be able to produce enough foliage to nourish the tree through another season. – How big are the wounds where branches have been broken or bark has been damaged? The larger the wound is in relation to the size of the limb, the less likely it is to heal, leaving the tree vulnerable to disease and pests. A two- to three-inch wound on a 12-inch diameter limb will seal over with new bark within a couple of years. – Are there remaining branches that can form a new branch structure? The remaining limbs will grow more vigorously as the tree tries to replace its missing foliage. Look to see if branches are in place that can eventually fill out the tree?s appearance. – Is the tree of a desirable species for its location? If the tree is in the wrong location (such as a potentially tall tree beneath a power line), or an undesirable species for the property (messy fruit, etc. ), it may be best to remove it if it has serious damage. If damage is relatively slight, prune any broken branches, repair torn bark or rough edges around wounds, and let the tree begin the process of wound repair. A mature shade tree can usually survive the loss of one major limb. The broken branch should be pruned back to the trunk. In the months to follow, large wounds should be closely monitored for signs of decay. Although the tree has been damaged, enough strong limbs may remain on a basically healthy tree to make saving it possible. Young trees can sustain quite a bit of damage and still recover quickly. If the leader is intact and the structure for future branching remains, remove the broken branches and let the tree close over the wounds and recover itself. If a valuable tree appears to be a borderline case, resist the temptation to simply cut the tree down and be done with it. In such cases, it may be best to stand back for a while and think it over. Remember that time is on your side. After careful pruning of broken branches, give the tree some time to recover. A final decision can be made later. Resist the temptation to prune too heavily. Remember that the tree will need all the foliage it can produce in order to make it through the next growing season. Remove only the damaged limbs, wait and see what happens. A healthy mature tree can recover even when several major limbs are damaged. With large trees, a professional arborist should be brought in to assess damage on a borderline situation, and to safely accomplish needed pruning and branch removal. Some trees simply can?t be saved or are not worth saving. If the tree has already been weakened by disease, if the trunk is split, or more than 50 percent of the crown is gone, the tree has lost its survival edge. This otherwise healthy young tree has lost too much of its crown -? the leafy head that is vital for survival. It will probably not be able to grow enough new branches and leaves to provide needed nourishment, and will never be able to regain its former beautiful shape. About all that?s left of this tree is its trunk. The few remaining branches can?t provide enough foliage to enable the tree to make it through another growing season. A rotten inner core in the trunk or structural weakness in branching patterns can cause a split trunk- the tree equivalent of a heart attack. The wounds are too large to ever mend,?and the tree has lost its sap lifeline between roots and leaves. This tree is all but dead. 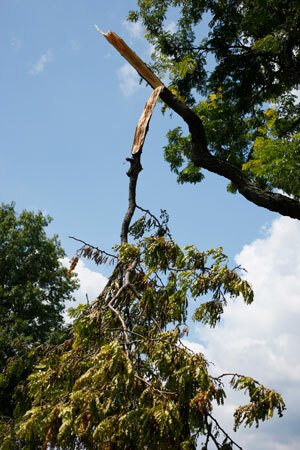 Some of your trees may have damage that?s too close to call, or may have hidden damage. To help with such questions, a tree professional may be needed to help you decide what to do about your trees. Don?t hire just anyone who shows up at your door following a storm. Look for qualified arborists in the phone book or by contacting your state or city forester. 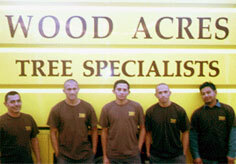 ?Wood Acres Tree Specialists‘ main focus is on Pro-Active Tree Care. Every effort is made to save your tree unless removal is indicated. All arborists on the Wood Acres team are certified and they have a Master Arborists on staff. ?They are TCIA Accredited (Tree Care Industry Association). ?TCIA Accreditation provides consumers a way to find tree care companies that are trustworthy in their business and tree care practices. Wood Acres Tree Specialists is licensed and insured and employs the highest adherence to safety and standards and ethics. In cooperation with the USDA Forest Service and the International Society of Arboriculture. This entry was posted in Cabling & Bracing, Damage, Pruning, Storms, Tree & Shrub Care, Tree Removal, Wood Acres Tree Specialists and tagged arborists, broken branches, broken limbs, Maryland, split trees, tree and shrub specialists, tree service Bethesda md, tree service Boyds md, tree service Brinklow md, tree service Brookville md, tree service Burtonsville md, tree service Cabin John md, tree service Chevy Chase md, tree service Colesville md, tree service Darnestown md, tree service dc, tree service Derwood md, tree service Gaithersburg md, tree service Garrett Park md, tree service Germantown md, tree service Glen Echo md, tree service Hyattstown md, tree service Kensington md, tree service montgomery county md, tree service Potomac md, tree service Rockville md, tree service Silver Spring md, tree service Spencerville md, tree service Takoma Park md, trees, Washington DC. Bookmark the permalink.